This coming Sunday, February 24th is the 85th annual Academy Awards or Oscars (as it has been officially rebranded). In our efforts to participate in this "Oscar" theme, we thought we would have our own little Oscar presentation. Beginning this Sunday, we will be featuring several oscar-style specials to choose from. 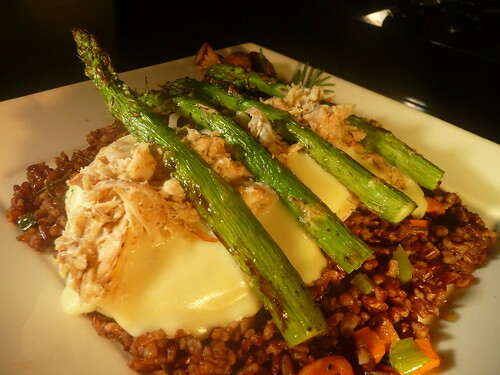 This dish has a bit of history behind it, dating back to King Oscar II, who was king of Sweden and Norway in the late nineteenth century.Typically, food prepared "Oscar" is topped with asparagus, crab meat and a bearnaise sauce (a Hollandaise sauce mixed with a tarragon reduction). Though veal was the meat of choice for King Oscar, today's "Oscar" can be made with a variety of different entrees. We promise, you will not find a better Oscar out there. From the choices above, you will get fresh asparagus, real lump crab meat (not the imitation cheap stuff) and fresh housemade bearnaise sauce. Each of these dishes will be offered for $12.75. For those of you that follow this yearly event (the reason we're offering these oscar specials for the week), this award celebration honoring actors, actresses, artists and directors from the film industry began back in 1929 at a private brunch at the Hollywood Roosevelt Hotel with an audience of only 270 people and at the cost of only $5 per ticket. My how times have changed! Over the course of the last few decades, this has become one of the highest rated television broadcasts and most sought-after events to attend each year. It is broadcast in over 100 countries around the world and has become a week-long extravaganza reporting on who is nominated for each of these awards. Its press compares with that of the Superbowl and Mardi Gras. And do not forget all of the talk on what all of the celebrities are wearing as they walk down the red carpet. With all the hype, discussion and glamor in attendance, you should know that this day is the worst day of the year for restaurants due to the fact that everyone is at home glued to their televisions watching. Don't despair...if you really want to stay home and watch the Oscars in the comforts of your own chair, we will be offering these for carryout as well. To keep the festivities going, we will even extend our little celebration through Thursday, February 28th. So come down and celebrate our Oscar week!